Soviet people were protesting and demonstrating on the regular basis but never against their own government. Well, that’s not exactly true. 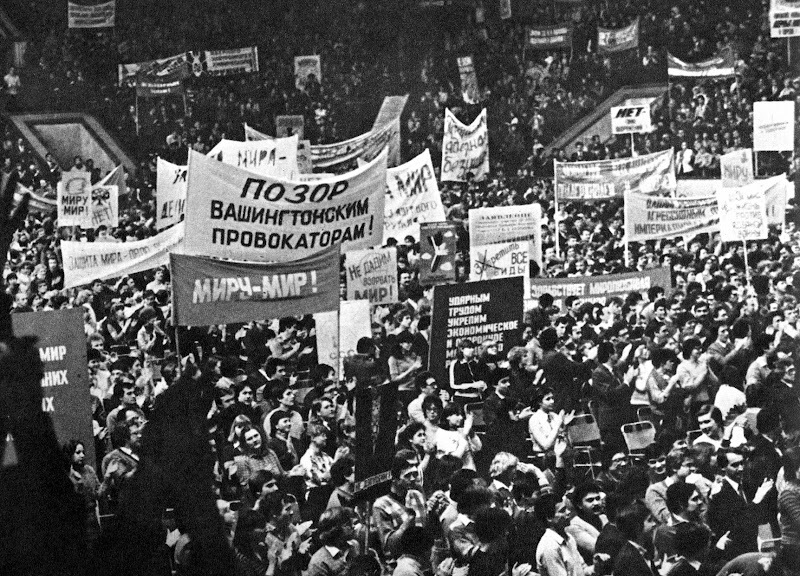 At least a few Soviet people tried to demonstrate and protest against their own government but in most cases were quickly swept up and ended up with lengthy prison sentences, forced psychiatric treatment or, in the best scenario, a house arrest. At the same time anti-American or anti-imperialist demonstrations were encouraged and sometimes mandatory. American: In America we have freedom of speech, I can stand in front of the White House and yell “Reagan is an idiot!” and nothing will happen to me. Russian: No big deal, I can go to the Red Square, yell “Reagan is an idiot!” and nothing will happen to me either. I saw this photo on a Russian blog today, followed by other random ones I found. Moscow. Soviet youth demonstrating against the war. The large white sign in the center says: "Shame on the Washington Provocateurs" ©A.Shogin 1984. Russian students demonstrating against US blockade of Cuba. Moscow, Russia.October 1962. ©Time Inc. Stan Wayman. Russian police keeping order during demonstration against US blockade of Cuba.Signs: "Shame on Aggressors", "Hands Off Cuba" ©Time Inc. Stan Wayman.